In the past few decades, the world has grown significantly smaller with inter-connectivity allowed by new technologies eliminating numerous barriers. While the current digital age has definitely simplified and speeded up multiple facets of trade and commerce, there are definitely a few areas where significant improvements and even disruption are possible, even necessary even today. One such area is the multi-billion-dollar global commodities trading industry. The physical commodities trading industry is worth trillions of dollars and primarily involves a complicated process of transferring goods across international borders from one part of the world to another. No matter what’s being transported, this is a complex process involving myriad stakeholders, regulatory authorities and middlemen. What’s more, the involvement of multiple players aside, large portions of the process are still paper-based which increases the possibility of fraud and data manipulation. If you are wondering why end to end digitization hasn’t happened in a system so important and complicated, the answer is — it has, but only partially. This is because as not all authorities or stakeholders trust digital systems and also because often a unified system has not been proposed. So obviously a trustworthy single window system might provide a more streamlined solution to these problems. · Limited financing opportunities especially for small and medium enterprises (SMEs). · Lack of trust among stakeholders due to the possible fraud and data manipulation. · Multiple levels of middlemen required for verification of paper documents. KRATOS™ is world’s first blockchain and cloud-based hybrid ERP platform. While the previous age of digitization was based on centralised databases which we now know are vulnerable to data breaches, the decentralised and highly encrypted nature of a blockchain-powered database like the one used by KRATOS™ is immune to the problems posed by legacy databases. This feature can potentially enhance trust among users of the system. But securing user data from potential unauthorised use and manipulation is not enough in itself. This is why KRATOS™ is also designed to provide reliable and secure access to the required data no matter what the business location is. One of the key components of the KRATOS™ system is the Token Curated Registry (TCR) that provides users access to the most relevant data and helps them find reliable global commodities trading partners/financiers. The process involves token holders curating the long list of possible trades submitted to the platform. These trades, once submitted, cannot be modified or otherwise changed — a feature unique to a highly encrypted blockchain system — which protects users from data manipulation and potential fraud. This curated list in effect shows users the most trustworthy potential trades. This eliminates the use of intermediaries at an early stage reducing time, cost and effort put in by businesses to identify the best possible trading and financing options. In fact, the use of this curated token system offers a single window solution to help SMEs not just secure potential trading partners but also financing from multiple sources including token holders, funds and family offices as well as traditional financial institutions like banks. After selection of a new trading partner/financier, the next step involves the parties course coming to a mutual agreement and this is simplified through the use of smart contracts. 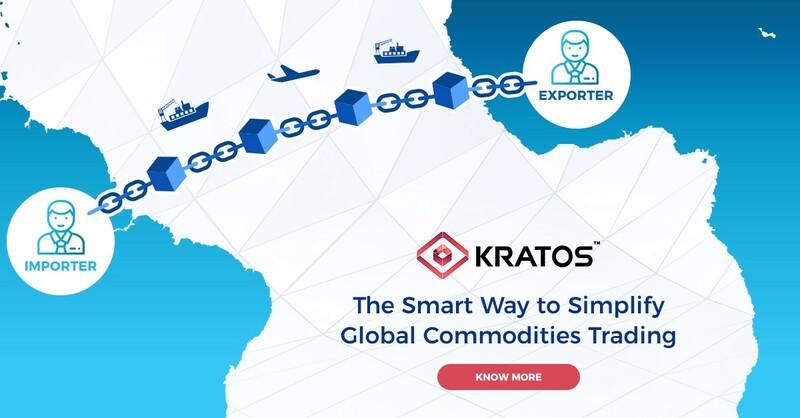 The KRATOS™ smart contracts system operates as an automated tool that ensures that transactions conducted on this blockchain- based physical commodities trading platform are highly secure as well as transparent. Those entering into the digitally signed smart contracts receive details of the agreement as well as information about rewards/punishments that are applicable to successful completion/breach of the contract. As these contracts can be sent out and enforced almost instantaneously, they represent a significant improvement over traditional paper-based contracts thereby potentially reducing overheads for businesses. What’s important to note here is that these are the immediately identifiable benefits of blockchain technology which by all accounts is in its infancy. Going forward we can only hope that solutions such as KRATOS™ will evolve further and provide benefits in as of yet unforeseen ways.